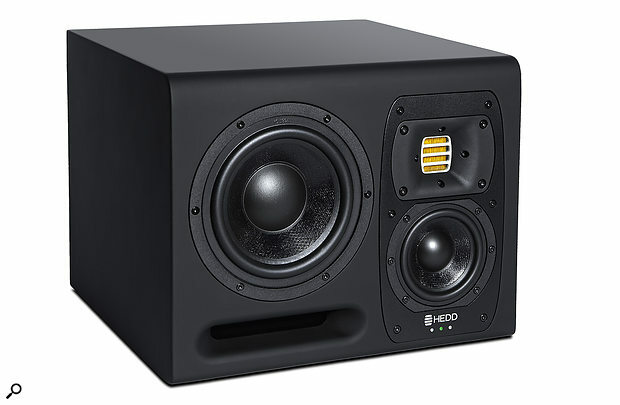 By combining traditional speaker engineering with a little help from software, HEDD have come up with a rather special set of monitors. HEDD, short for Heinz ElectroDynamic Designs, are relatively recent entrants to the nearfield monitoring market. However, the company have a long history in the field thanks to its founder Klaus Heinz, who for many years was Head of R&D at ADAM Audio. Heinz, along with his son and mastering engineer Fredrik Knop, launched HEDD in 2015 and the company now boast a range of four active nearfield monitors and a fascinating stand-alone app/plug-in called Lineariser, which optionally applies time-domain compensation, including of low-frequency group delay, to the company’s monitors. It will be fascinating to see what effect the Lineariser has on audible performance. Before I cut to that chase, there’s some description and analysis to cover. The compact three-way arrangement of the Type 20 drivers is one that we’ve seen on a few nearfield monitors in recent times. Neumann with the KH310A, ATC with the SCM25A, and Dynaudio with the Lyd 48, for example, have all come to the same conclusion that low-, mid- and high-frequency drivers, arranged with the first alongside a vertically orientated array of the latter two, is a good idea. But there’s no plagiarism going on here — the similarities simply reflect acoustic engineers faced with the same design problem arriving at the same logical solution. The design problem to be solved is that, while a vertical array of all three drivers would seem to offer the most consistent horizontal dispersion (because the path length from each driver to the ears remains relatively consistent at different horizontal angles), there’s no getting away from the fact that compact, landscape-format monitors often better suit nearfield monitoring installations. And the reason that, what I’m going to christen, the “three-way compound landscape” format squares this particular circle is thanks to the difference in wavelength at the low/mid and mid/high crossover frequencies. At the mid/high crossover, 2.5kHz on the Type 20, the wavelength of sound is 13.4cm, which isn’t too far away from the physical distance between the two drivers. This means that only a small change in path length from driver to ears will result in a relatively large change of inter-driver phase, and significant discontinuities in the frequency response. So for the mid driver and tweeter, vertical orientation is vital for consistent horizontal dispersion. At the Type 20’s 250Hz low/mid crossover, however, the wavelength is 1.37m and the distance between the drivers is around 18cm, so driver path-length changes at different listening positions horizontally are a much less significant fraction of the wavelength. Inter-driver phase changes will therefore be relatively innocuous. That being the case, it’s a perfectly reasonable decision to put the bass driver alongside the mid/tweeter array. The only complication being that, for the sake of dispersion symmetry, the two speakers of a pair need to be ‘handed’ (ie. mirror images of each other). I’ve illustrated with some FuzzMeasure curves in Diagram 1 how the asymmetric nature of the Type 20 is expressed in its horizontally off-axis frequency response. In the diagram, the orange curve is the on-axis frequency response, the blue curve was taken 20 degrees off-axis on the mid/tweeter side of the enclosure and the purple curve 20 degrees off-axis on the LF driver side. It’s clear that the response gets a little messy on the LF driver side. Diagram 1: The Type 20’s frequency response on-axis (orange), 20 degrees to the HF side (blue), and 20 degrees to the LF side (purple). Having described how the drivers are arranged on the front panel, it perhaps makes sense to describe the drivers themselves. Starting with the bass driver, it’s a nominally 180mm unit with an “Ultra Honeycomb Composite” diaphragm, a rubber surround and a large (50mm) voice coil. Little information is published on the driver’s magnet system, but there are few reasons to believe it is particularly out of the ordinary — other than it being pretty large for a relatively small driver. 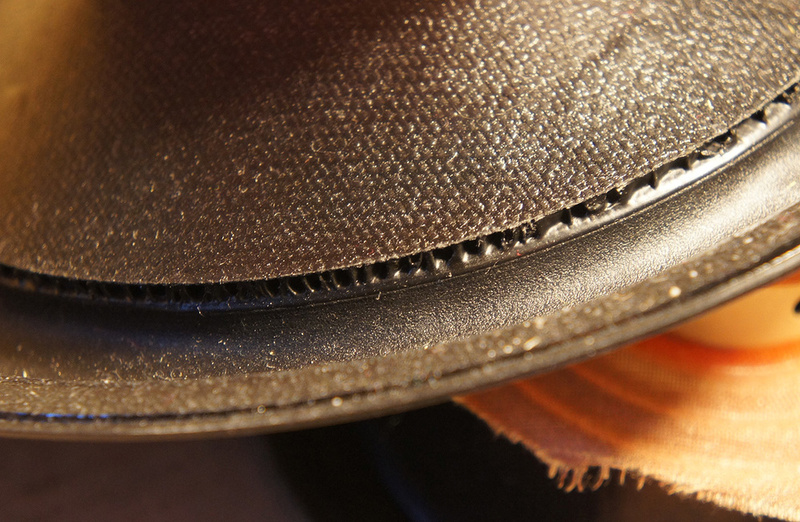 The 120mm-diameter mid-range driver also appears to be a relatively conventional unit, once again featuring HEDD’s proprietary Ultra Honeycomb Composite diaphragm and a rubber surround. The story behind the diaphragm material is clearly an interesting one because Klaus Heinz revealed to me that it was the discovery of the material, sourced from an unnamed Far Eastern supplier, and the realisation that its mechanical qualities were so exceptional, that persuaded him to develop a new range of monitors around it and found HEDD. He supplied me with examples of the bass and mid driver diaphragms from the Type 20 and I can confirm that the material really is extraordinarily light and rigid. 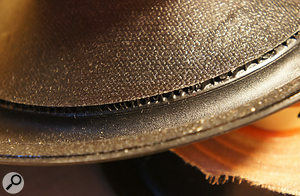 I’ve included an edge-on photograph of the bass driver diaphragm, and its honeycomb sandwich nature can clearly be seen. Both the low and mid driver cones use a lightweight but rigid material that HEDD call an Ultra Honeycomb Composite.Lastly, the tweeter. If you are familiar with the Klaus Heinz-designed ADAM range of monitors it will come as no great surprise that the HEDD Type 20 employs a ribbon-style tweeter based on the Air Motion Transformer principles developed by Oskar Heil back in the early 1960s. Briefly, the Air Motion Transformer concept takes the guts of a lightweight conductive ribbon suspended in a magnetic field, familiar from ribbon microphones, and turns it into a viable tweeter by pleating the ribbon in the manner of accordion bellows. The pleats effectively multiply the ribbon’s radiating area to increase efficiency and power handling without increasing its planar dimensions, which would otherwise significantly restrict its high-frequency dispersion. With the efficiency versus dispersion problem solved, an AMT tweeter is able to display some fundamental advantages of the ribbon concept over the more common moving-coil dome device: firstly, the ribbon is driven over its entire area rather than just at its perimeter, and secondly it lacks the often problematic fundamental resonance of a dome that’s often all too close to the high-pass crossover frequency. To my mind there are few negatives inherent to AMT tweeters and without exception all the monitors I’ve heard recently that use one have demonstrated notably satisfying HF performance. Hopefully the Type 20 will continue the trend. The rear panel houses the balanced and unbalanced inputs; HF, LF and gain controls; and an expansion slot for use with an optional digital interface card.Around the back of the Type 20 is an amplifier heatsink and connection panel and that offers only balanced and unbalanced analogue input options. The Type 20 is entirely analogue in terms of its internal signal chain so no digital inputs are available as standard. However, HEDD manufacture an optional Bridge module that sits in an accessory slot on the back panel and offers USB, AES3 and AES67/Dante (network audio) inputs. Accompanying the signal and mains connection sockets are a variable gain knob (with an indent at 0dB) along with 200Hz low-shelf EQ and 2kHz high-shelf EQ. The EQ knobs have no detents so it’s not that easy to be sure that both speakers of the pair are set up identically. Behind every driver there’s an amplifier, and the Type 20’s amplification comprises three 300W Class-D modules from Bang & Olufsen offshoot ICEPower. ICEPower were originally founded by B&O in 1999 after they invested in the design ideas of PhD student Karsten Nielsen, and they are now probably the main competitors to Dutch company Hypex, whose Class-D amplification modules can be found in quite a few pro-audio monitors and hi-fi active speakers. It seems to me that Hypex and ICEPower have pushed each other hard over the last decade or so and the performance generally of Class-D amplification has improved (from, it has to be said, relatively modest beginnings) to the point where I think it can now be said genuinely to compete in sound-quality terms with traditional amplifier topologies. The fundamental advantage of Class-D amplifiers over conventional designs is efficiency. Where a 100W Class-A/B amplifier will typically be around 50 to 60 percent efficient (and dissipate the missing power as heat), a similarly powerful Class-D amp will easily reach 80 to 90 percent efficiency. As a result, Class-D amplifiers can be made significantly smaller and less expensive than Class-A/B amplifiers for a similar power output (mostly because so little heat-sinking is required). The relative affordability of Class-D amplifier power has consequently provided opportunities for designers of active speakers to use the extra headroom available to apply equalisation in order to extend low-frequency bandwidth and to flatten frequency response. The HEDD Type 20 employs such techniques in the form of analogue equalisation within its internal electronics, but its real USP in terms of equalisation is to be found in the Lineariser app I mentioned earlier. The Lineariser can be configured as a DAW plug-in or a stand-alone app and it behaves identically in each mode. When launched, the Lineariser first requires that the specific HEDD monitor in use is selected. Slightly frustratingly, it defaults back to the HEDD Type 05 when closed and occasionally I forgot to re-select the Type 20 when I next came to open or insert it. The Lineariser provides two functions: firstly it applies frequency domain equalisation configured to optimise the monitor frequency response, and secondly it applies time-domain compensation to normalise the various time-delay and phase ‘errors’ inherent to the monitor throughout its operational frequency band from 20Hz to 20kHz. Frequency-domain equalisation is of course not unusual, although it normally takes place within the monitor’s internal electronics, and it intuitively makes sense that if the means is easily available it would be worthwhile to ‘flatten’ or otherwise optimise the frequency response of a monitor. Time-domain compensation, however, is found in very few monitors (I can think of just three others off the top of my head: the KEF LS50 Wireless, the Kii Three, and various PSI models), and you might well ask: what is the need or the point? Well, the point is that there are various mechanisms throughout moving-coil loudspeaker systems that result in different frequencies reaching the listener’s ears at different times. Firstly, in multi-way monitors with drivers located at different positions on a front baffle, there are the differences in path length from each driver to the ears. Secondly, the low-pass, band-pass and high-pass filters that integrate the drivers inherently result in phase changes which, from a time-domain perspective, can be expressed as time delays. The technical term for this is ‘group delay’ and the steeper the filter slope, the longer the group delay. Thirdly, the fundamental nature of moving a driver diaphragm, which obviously has mass, against the compliance of its suspension and, in the case of bass drivers, the volume of air in the enclosure, also results in group delay. And finally there’s the special case of the fundamental high-pass filter that defines a speaker’s low-frequency bandwidth. The degree of group delay fundamentally depends on the type of LF system (ported, closed-box, transmission line, etc) and if you’re struggling to visualise how such low-frequency delay arises, consider the case of a ported speaker. The function of the port is to reinforce the radiation from the bass driver. If it’s going to reinforce, however, the acoustic energy radiating from the port must be in-phase with the bass driver. But the energy of the port originates from the back of the bass driver diaphragm, and that’s 180 degrees out of phase with the radiation from the front. So the port effectively flips the phase of the energy from the back of the bass driver diaphragm, but, in a universe where cause precedes effect, that takes time. If the port is tuned to, say 40Hz, a 180-degree flip takes 12.5 milliseconds. To put all this into context, if a manufacturer of a DAW interface launched a product on which the in/out latency varied with frequency and, say, was 15ms or more at low frequencies, you’d probably raise an eyebrow or two. Without you even realising it, however, it’s likely that your monitors have been doing something like that all along. Diagram 2: The speaker’s impulse response, with the Lineariser bypassed (pink) and engaged (orange). In Diagram 2 I’ve illustrated the Type 20’s impulse response, captured using FuzzMeasure, with and without the Lineariser. Without the Lineariser (the purple curve), the different arrival times of HF and LF energy can be clearly identified. The sharp transient of the HF arrives first followed a few milliseconds later by the gentle hump of the LF. In total, the energy is spread out over something like 12ms (although low-frequency ringing is apparent right out to 40ms). With the Lineariser in play, however, the output is pretty much all over within 7ms and, perhaps more importantly, there’s no distinct gap between LF and HF. This all seems unambiguously good news, however there are two questions that remain. Firstly, is there a downside to linear phase? And, secondly, are the objective improvements brought to the Type 20 by the Lineariser subjectively (and usefully) audible? The answer to the first question is yes, there is a downside, although depending on the circumstances it can be relatively benign. The downside is that in order to normalise delays across the whole bandwidth, the frequencies that would otherwise arrive at the ears first have to be slowed to match the arrival of those that would otherwise arrive later. So the monitor will unavoidably have a degree of in/out latency that might well be unacceptable if it is to be used for tracking or overdub monitoring. The Lineariser screenshot I’ve included shows, among others things (that I’ll get to in a moment) three phase correction options that each result in different degrees of latency. Selecting the ‘Linear (phase) full range’ option provides time-domain compensation across the full bandwidth (20Hz to 20kHz) but results in 100ms in/out latency. The, ‘Linear >500Hz’ option limits time-domain compensation to above 500Hz but cuts latency to a much more reasonable 5ms. Finally, the ‘Minimum Phase’ option switches off time-domain compensation entirely to leave just the frequency-domain equalisation in place. The latency in this case is just 2ms, which presumably simply reflects just the basic app latency. The options enable the latency to be reduced to acceptable levels in recording situations where it becomes a problem. The other two options provided by the Lineariser (the ones I said I’d get to in a moment) engage either ‘flat’ or ‘HEDD alignment’ frequency-domain equalisation curves. The ‘flat’ curve is self explanatory; it applies an anechoic flat response to the monitor. The ‘HEDD alignment’ curve, in contrast, applies the manufacturer’s preferred EQ, which primarily involves a few dB of LF boost. For what it’s worth, I preferred the flat option. The Lineariser software has three different options offering different balances between monitoring latency and phase linearity. The second question I posed a paragraph or two back brings me finally to describe what I heard with the Type 20 up and running. I set them up as usual either side of my workstation, with their mid/tweeter arrays innermost, on rigid but well-damped wall brackets. To begin with I left the Lineariser bypassed, but even so I was decidedly impressed from the word go. I have some experience with a couple Klaus Heinz’s previous ADAM monitors and have never been entirely convinced by their performance, but with the Type 20 I immediately had no doubts that I was listening to a really classy monitor. The combination of the characteristically detailed but unforced quality of the AMT tweeter with a seriously uncoloured, clean and revealing mid-range performance was both rewarding in terms of enjoyment and productive in terms of monitoring duties. My guess is that Klaus Heinz’s enthusiasm for the new diaphragm material is justified — there’s something quite special about the Type 20’s mid-range quality. The low-frequency performance is notable too: it’s a ported monitor but sounds much closer to a closed box in character than the majority of ported systems I’ve heard recently. The relatively low port tuning frequency (below 40Hz) undoubtedly helps, but also perhaps that hugely rigid diaphragm material also plays a part. Diagram 3 shows the close mic port output and the 40Hz tuning, but also reveals that, other than a relatively low-level feature at around 530Hz, the port is free of organ pipe resonance. Diagram 3: The output at the port exit. In general terms, along with a great sense of revealing clarity throughout the whole bandwidth, the Type 20 has a nicely judged tonal balance and presents the stereo image superbly well. To my mind, depth portrayal and stereo image focus go hand in hand with the clarity that arises from driver and system design that majors on minimal distortion and stored energy. There’s little as detrimental to stereo image quality, for example, than cabinet panels that play along with the music, and the Type 20 cabinet feels extremely inert. The Type 20 also has that undefinable quality that properly sorted three-way systems often possess: a sense that it’s a grown-up monitor. It can play at high levels without any sign of strain and its LF bandwidth is extended well into midfield monitor territory. And so, safe in the knowledge that the Type 20 is already a very good monitor, I engaged the Lineariser (a line that I’m sure Dr Who must have uttered to one of his/her companions at some stage). I went straight for the full-fat whole bandwidth linear-phase option, and at first it was a somewhat unnerving experience. To begin with, I wondered why I’d made such a fuss, because when doing repeated A/B comparisons between Lineariser engaged and bypassed the difference wasn’t as game-changing as I’d imagined it would be. There was a difference for sure and the performance with the Lineariser significantly improved, but it was a relatively subtle increase in clarity and space around mix elements rather than a night-and-day revelation. As I began to listen more, however, spending longer periods with the Lineariser sometimes engaged and sometimes bypassed, and sometimes not fully concentrating on the sound, I began to realise that the Lineariser was doing something genuinely interesting but (somewhat inconveniently for my purposes here) not easy to describe. The best analogy I can come up with is that it reminded me of an effect that occurs when you’re looking at the night sky: faint objects are sometimes easier to see when you’re not staring directly at them. So, with the Type 20 and the Lineariser, when I concentrated on a particular element of a mix and did an A/B comparison, the improvement was relatively subtle. But if I stopped concentrating, relaxed and listened to the whole mix, the overall experience was invariably more satisfying and revealing with the Lineariser engaged. If you’re anything like me (and the fact that you’re reading Sound On Sound makes that not unlikely), you’ll always be listening and analysing how mixes are put together and how tracks are produced, but sometimes it’s when you’re not really concentrating that something will suddenly become apparent — and the Lineariser seemed to be making that happen much more often. With the Lineariser engaged, music kept catching me unaware and grabbing my attention. Music simply sounded more convincing and explicit more of the time and it wasn’t long before I was using the Type 20 exclusively with the Lineariser engaged. 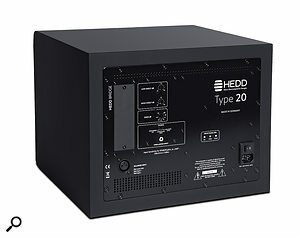 My time with the HEDD Type 20 and Lineariser became one of the most interesting of all the recent monitor reviews I’ve done. Thanks to some previously less-than-entirely satisfactory experiences with ADAM monitors I came to the Type 20 slightly sceptical, but found my skepticism entirely unjustified. I came to the Lineariser expecting to hear obvious benefits akin to turning on a light switch, but I found it has a far more subtle and more interesting effect. In the end, there’s no question that I’d use the Type 20 and Lineariser for serious mix work, and they might even begin to change the way I listen. I’ve mentioned a few other monitors in the body of the review that do time-domain compensation natively (albeit not full range), and one of those, the PSI A17-M inhabits a very similar price slot to the Type 20. Other more conventional monitors in approximately the same ball park might be the Neumann KH310A, the Focal Twin 6 BE, the Barefoot Footprint 01 and the Genelec 8350. Talk about being spoilt for choice! 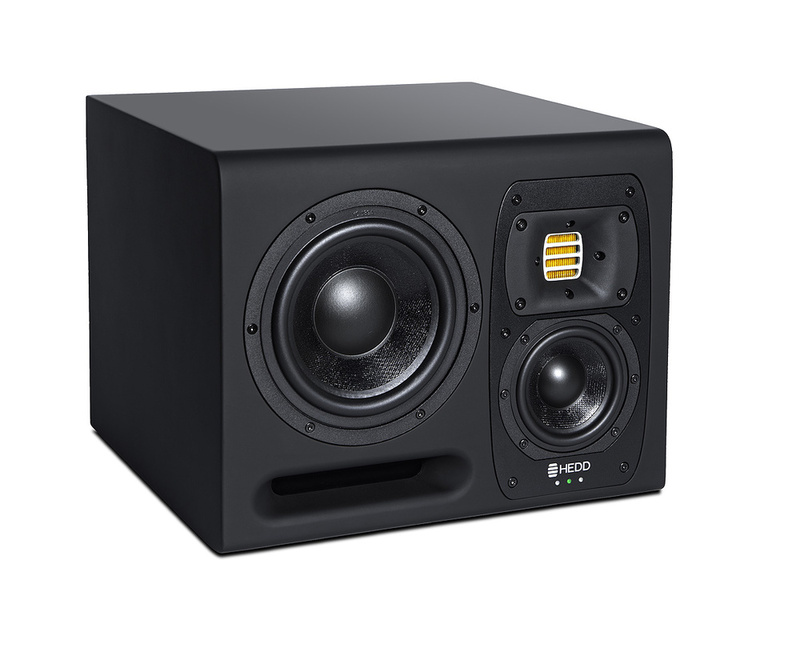 Classy electro-acoustics and engineering result in a fundamentally great monitor. The Lineariser adds a new element to monitoring performance. 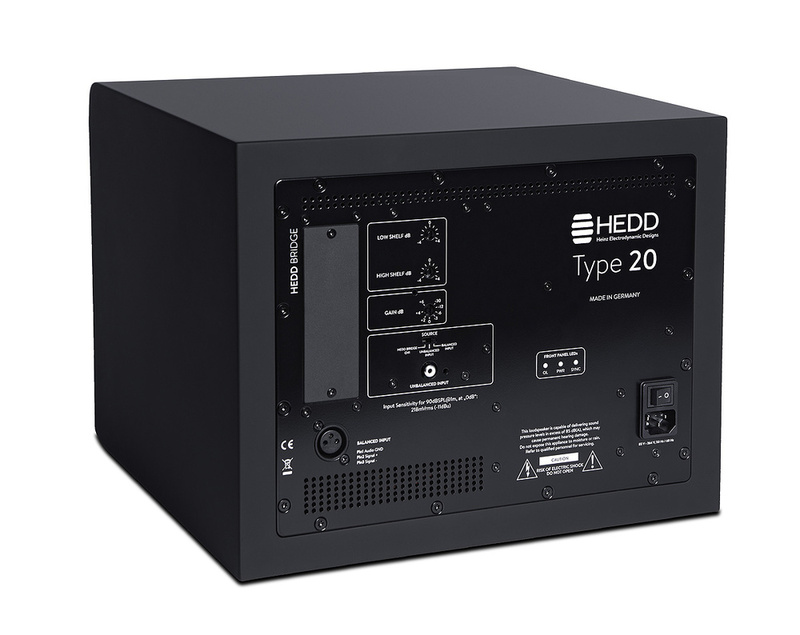 The Type 20 alone is a fine monitor that easily competes with products of a similar price level and higher. But add the Lineariser and together they become something unique and rather special. £2998 per pair including VAT.